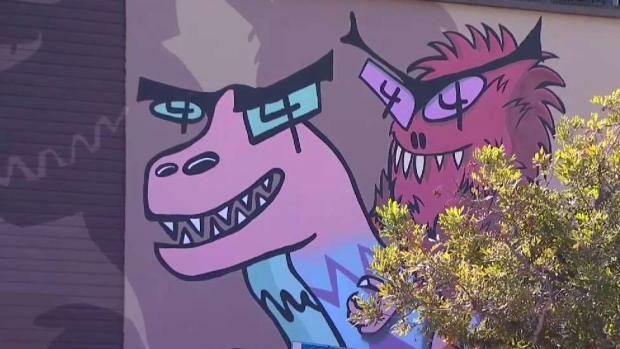 Crews could be seen Monday spraying over the towering "Weenasaurus Rex" mural that was painted on an outer wall of what will soon be a "small-format" Target store. Weenasaurus Rex is a giant sculpture in North Park that some say is a representation of their community. NBC 7's Audra Stafford reports on efforts to save the mural. The artist behind the mural, who goes by Madsteez, posted Monday on social media a photo of his mural being covered up with the caption, "Goodbye old friend ��....looks like @target won." "Talk about gentrification, man," Hutson said. "You’re taking something that was like, wholesome and organic and turning it into cookie-cutter corporation stuff." Target's mini store will feature products typically found in one of the chain's retail location, including apparel, groceries, and entertainment goods. There will also be a CVS Pharmacy inside. "There are people all over San Diego that don’t get a chance to experience North Park, so if it take a big name like Target to attract outsiders in, then maybe it will help the community as a whole," he said. "But taking away something meaningful from the community to put in something that is not sentimental... A Target may be useful, it may be handy, but it’s not sentimental." The retail store did say they would have a "curated assortment" of goods to fit with the community and worked with the North Park Planning Committee and North Park Main Street to commission local art for the store. The store was set to debut in November but Target's website now lists the North Park location on their list of store openings slated for 2019.